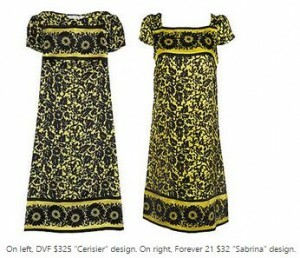 The famed designer thinks cheapie-fashion store Forever 21’s $32 “Sabrina” smock dress looks suspiciously similar to her own $325 “Cerisier” design. Von Furstenberg’s studio filed a copyright-infringement lawsuit last week against Forever 21, claiming the downmarket retailer willfully copied the pattern, colors, and measurements of her popular frock – as well as another dress from a previous season. While the fashion industry has long been plagued by counterfeiters hawking knockoffs on Chinatown street corners, rarely do established mass-market retailers so brazenly mimic high-end designers’ current-season offerings, von Furstenberg’s lawyers say. Hat tip to the guy reading the Post next to me on the 320 bus.